UK premier David Cameron says that he is continually impressed by the charity SpecialEffects. British Prime Minister David Cameron has praised the charity SpecialEffect for its efforts to make videogames and technology more accessible to those with disabilities. He was also full of kind words for the UK game industry, which has supported SpecialEffect efforts over the last two years. SpecialEffect's facility is based in Cameron's constituency of Witney in Oxfordshire. 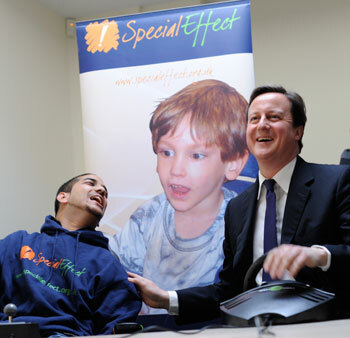 Speaking at the opening of a new dedicated games room for disabled players, Cameron said that SpecialEffect's commitment to make the lives of disabled people better continually impressed him. Cameron went on to say that the charity's work brought together three things that he was passionate about: helping the disabled, using technology in innovative ways, and corporate social responsibility. SpecialEffect receives some of its funding from the GamesAid charity, which is a videogames industry based charitable broker, raising funds and then distributing them to selected children and young person's charities. The work done by SpecialEffect, Cameron said, showed that just a small investment from businesses could make a significant difference to people's lives. Andy Payne, head of trade organization UKIE, said that videogames were often unfairly vilified, but the medium had a variety of "social, cultural and health benefits." He added that SpecialEffect was just one way in which videogames helped enrich people's lives, and said that the charity would have the industry's full support in the future.